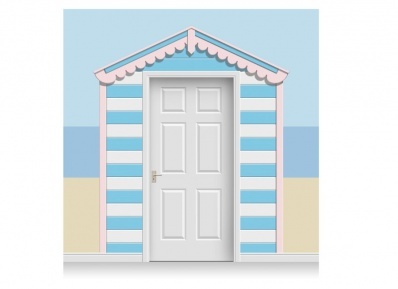 Colourful Beach Hut mural, featuring a weathered wood finish, designed to fit around an exisiting door frame. 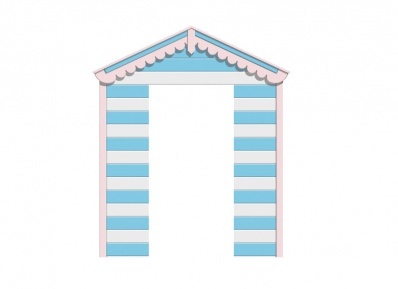 This colourful Beach Hut Mural is designed to fit on the wall around an exisiting standard-sized door frame. It features a weathered wood texture finish to the painted panels. The mural is 218cm wide and 257cm high overall, and comprises three drops of wallpaper (one above the door and one on each side). If your wall height is less than 257cm, you may have to trim off some of the roof apex at the top of the mural. This should not detract from the overall effect of the design. See the Layout Diagram for more detail. 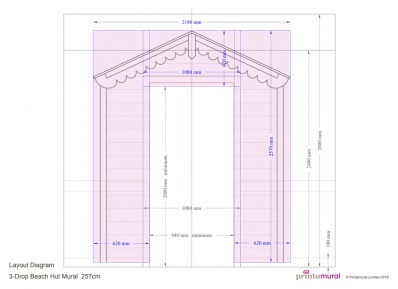 Although this wallpaper mural is designed to fit around a standard size door frame 98cm wide x 215cm high, it does include plenty of excess material so that it may be trimmed to fit accurately around slightly smaller door frame sizes. View the Details Tab for more information. Please note that the sand, sea and sky shown in the Example illustration are indicative and do not form part of the mural. View the Material Options Tab to find details about the different wallpaper and print materials that we have available. For more detailed information about materials, please view and download our Material Specifications. To order a material sample, please see View & Order Samples. View the Material Options tab on the product page to find details about the different wallpaper and print materials that we have available. This self-adhesive vinyl material is robust and tear-resistant. The applied laminate has a satin matt finish and adds some protection against spills and scrapes. It is very easy to install and has a high-tack adhesive that will adhere to most normal wall surfaces. Wall surfaces must be completey dry and flat. This self-adhesive polyester material is tear-resistant and has a satin/matt textured finish. It is very easy to install having a low-tack adhesive, and has the added advantage of being repositionable if necessary. It also leaves no adhesive residue when removed. Wall surfaces must be completey dry and flat.